Place the milk and sugar in a saucepan and bring to a gentle simmer, stirring, over medium heat. Add the rice and simmer for 5 minutes. Remove the pan from the heat, add the chocolate and mix through. Pour the mixture into a 1.5 litre baking dish. Dust with cinnamon. Transfer to the oven and cook for a 40-45 minutes until the rice is cooked, and the rizogalo is thick and creamy. 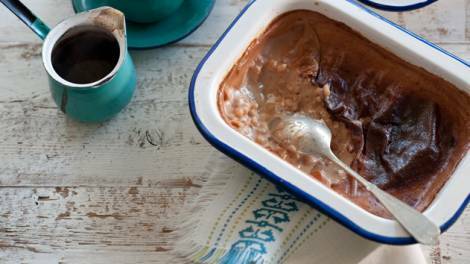 Allow to cool for 10 minutes before serving the Chocolate Rizogalo – Greek Rice Pudding. ©2012 Maria Benardis. All Rights Reserved.